Three earlier blogs now combined into 1 complete blog covering medals, paperwork, amounts awarded and equivalents. The basis for this medal was made in 1789 in the form of the Ehren-Denkmünze für Tapferkeit (honor remembrance coin for bravery) by the Habsburg emperor Joseph II. In its original form it had two classes, gold and silver, for ranks below officer who had distinguished themselves in combat. In 1809 by Emperor Franz II the form was changed to make it a wearable medal that was also renamed in Tapferkeitsmedaille – Bravery Medal. Then again in 1848 the silver class was split into two classes. Next to the original Silver class (40mm in diameter) a second class was added that was smaller in size (31mm in diameter). Emperor Franz-Joseph I in Februari 1915 added a Bronze class with the same size as the silver medal 2nd class (also 31mm in diameter). A last change was made by Emperor Karl in 1917 in making the Golden class and the Silver 1st class medal available to officers. Until then officers had no specific gallantry medals apart from the Military Maria Theresia order that was only very rarely awarded for extreme examples of gallantry. Most officers received the regular medals that were available for officers that were awarded for gallantry but also other other forms of distinguished service. In all these periods the medal would have the ruling Emperor of that moment on the observe and the words “Der Tapferkeit” (The Bravery) on the reverse. Karl would change the text on the reverse to the Latin text “FORTITVDINI” as that language was neutral in an empire where the first languange of many people was not German. With two emperors during the war there were also two versions of all medals from gold to bronze with either Franz Joseph I and from 1917 onward Karl on the observe of the medal. Franz Joseph had 3 versions of his head on the medals during his very long reign. The third version was the regular one for WW1 but the 2nd and even the 1st version could still be awarded if available. This was mainly the case with early awards of the Golden Bravery Medal. A novelty in WW1 was that all classes could be worn next to each other. Before that period only the highest award of the medal would have been worn. For each next award in the same class a clasp (introduced in October 1915) could be worn on the medal ribbon with 4 bars as the maximum (which obviously was extremely rare in any class). As officers also could get an award of the Golden and 1st class Silver medal from late 1917 onwards a difference had to be made. This was done in the form of a capital K letter on the triangular ribbon. These existed in both gold (gilded) and silver. An officer could wear both medals of the same class, one with the K device and one without the K device (so awarded as an officer and nco for different occasions). As all officers in training went through the non-commissioned ranks before becoming commissioned they were during this training period also eligible for the Bravery Medals. So WW1 Austro-Hungarian officers groups often have Bravery Medals in the group. This is just a sign that the officers was not yet commissioned when he received the medal. The ones with the K on the ribbon are much rarer. The winners of the Gold and both classes of Silver medals also received an additional monthly payment. The Bronze class was excluded from this so it was also of financial interest to soldiers to receive the highest possible level of Bravery Medal as the payment was doubled for each higher class. Only the highest class was paid and only for one instance of the award. Multiple awards did not multiply the amount received. 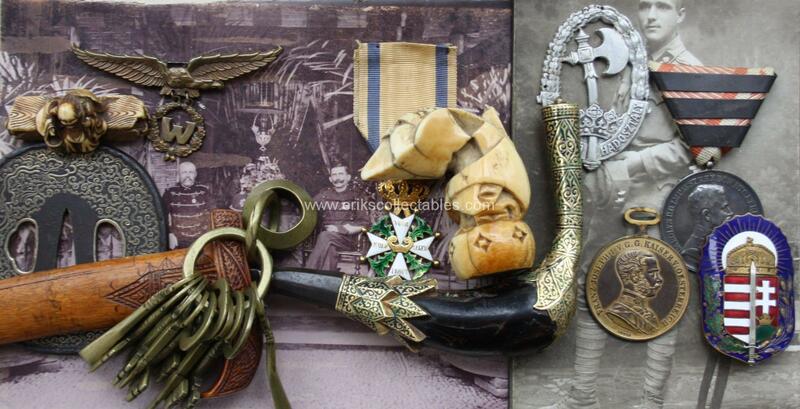 Before WW1 all medals would have a fixed eye for the ribbon. Only during the war this was replaced with the more standard moveable eye for the ribbon fixture. The only exception to this would be the Golden Bravery Medal that would remain using the fixed (Henkelöse) version. This makes it relatively easy to recognize the non official version of the Golden version. Private/non-official versions of all medals would be made during and after the war. These are not “fake” but bought examples of these medals. Especially real Golden Bravery Medals were often sold for the gold value in the post war period and replaced with a privately purchased gilded version. Well worn example of the Golden Bravery Medal (gilded bronze, stamped BRONZE on rim. The majority of FJI examples were gold (14/15), the majority of Karl examples were gilded bronze (17/18). Gold versions of Karl are the rarest and gilded bronze versions of FJI (16/17) are the second rarest. The official versions can also be recognized by the name of the artist below the head of the Emperor. On most private versions this name was not copied! Three names can be found. Two for the FJ versions: Tautenheyn and Leisek. The Karl versions all have Kautsch. From 1916 onward the Golden version became to expensive to be awarded. A gilded bronze version was made that would have BRONZE stamped in the rim of the medal. These medals were planned to be exchanged for real gold after the war. As the war was lost this never happened nor would the winners get their additional payment for the new Governments in the countries that would come into being after the war. Karl was on the front often, also for award ceremonies. He only handed out real gold versions. These are the rarest variation of the Golden Bravery Medal. It was also possible to replace the golden medal when lost or to get a second version. These are marked with the HMA (Hauptmunzamt) stamp next to the material stamp. The Austro-Hungarian army was well organized in its paperwork. Each request for a medal would go through the hierarchy and be kept in the personal record when awarded. It would depend on the level of the medal in which stage of the hierarchy the decision would finally be made. For the Golden Bravery Medal a separate register was kept that still is available as a reference in the Vienna Military Archives. After the medal was awarded the person would receive an award paper (Legitimation) confirming the award which should be worn on the person (to be able to proof the medals that were actually worn in the field). The standard place to keep these papers were the small ID capsules each person would wear. This made it necessary to make the documents very small. Here are some examples. Some units made more elaborate documents available for their men in a larger size. These are not standard and not official but relatively rare and desirable. Personell files were partially lost in the 2nd world war and also these were split between the different states that resulted from the end of the Austro-Hungarian empire. The Honvéd related files are mostly in the Hungarian Military Archives in Budapest and most others in Vienna and some in the other states. Here an example of Bravery medal related request as found in the Hungarian archive. An interesting secondary source for Hungarian WW1 bravery medals related info are the Vitezi rend yearbooks in which also medal lists are published. The German Iron Cross is probably the most iconic award in the world. As part of the same coalition an exchange agreement between Germany and Austro-Hungaria was made for their armies. Were the German award system is the same for all ranks this is not the case in the Austro-Hungarian (AH) award system were there are specific medals for officers and different medals for the nco ranks. For the Germans the Iron Cross was the most general medal for gallantry so a good basis for exchange. But this would not fit the AH system. Therefore the choice was made to make the German Iron Cross only available to the officers in the AH army. The 2nd class for troop officers and the 1st class only for high ranking officers which can be seen in the extreme low amounts awarded. This only began to change slightly in the last year of the war. For the ranks below officer a different solution had to be found. This came in the form of the Prussian Warriors Merit Medal (Krieger Verdienstmedaille) that always had been intended for foreign soldiers of ranks below officer. It was worn on the same ribbon as the Iron Cross which made the distinction between officers and men a bit more tolerable. The Iron Cross could be awarded to the lowest rank of officer (Fahnrich) and also to Officer replacements. Most officers that became an officer during the war had gone through the nco ranks as part of their officers training and often had been awarded medals for the nco ranks in that period. As soon as they were officers they would be eligable to receive the German Iron Cross. So in mixed groups (officers that had been a nco before) both officers and nco medals can be found. This often leeds to the misunderstanding that the German Iron Cross could be awarded the nco’s as well in the AH army – which is not the case. The award criteria for gallantry medals are very different in each country as is the structure of the army and the processes to award medals. So a comparison of “level” is not possible. But a comparison of relative numbers of awards should be possible. To do this I have taken some data from online sources and combined those. I have taken the number of men mobilized between 1914 and 1918. Further I have taken the number of awards per class and compared these with the number of mobilized men. Both as an percentage and as 1 decoration awarded per how many mobilized men. There are several reasons why this comparison is not “fair”. The AH Bravery Medals were aimed at the men below the rank of officer. No other gallantry medals could be given to them. The German Iron Cross in the German army was open to all ranks. Next to this there were many other awards for gallantry/bravery from the different states within Imperial Germany. Those facts are not taken into account – it is a simple, straightforward comparison of numbers only! Nevertheless I have made the comparison in numbers and found to my surprise that even the total relative amount of Iron Crosses is way bigger than that of Bravery Medals. Even the “unpopular” Bronze Bravery Medal is relatively rarer than an Iron Cross 2nd Class. And the Silver Bravery Medal 1st class can be compared to the Iron Cross 1st class in relative amounts. The last part of the statistics show the numbers I have taken from the reference below and state the amount of German Iron Crosses (IC) and Prussian Warriors Merit Medals (WMM) that were awarded to members of the Austro-Hungarian army.